Director – Matthew Robbins, Screenplay – Matthew Robbins, Brad Bird, Brent Maddock & S.S. Wilson, Story – Mick Garris, Producer – Ronald L. Schwary, Photography – John McPherson, Music – James Horner, Visual Effects – Industrial Light and Magic (Supervisor – Bruce Johnston), Special Effects Supervisors – Dan Lester, Ken Pepiot & Al Winiger, Production Design – Ted Haworth. Production Company – Amblin/Universal. A real-estate developer wants to raze an old tenement block so that he can build a new high-rise but is blocked in his plans by a group of tenants that refuse to leave the building. He hires a Latino thug to terrorise the tenants into leaving. Seemingly in answer to the tenant’s prayers, a family of cute, dinner-plate sized UFO’s arrive then, bringing salvation. After Steven Spielberg made it big with Raiders of the Lost Ark (1981) and E.T – The Extra-Terrestrial (1982) in rapid succession, he gained enough clout to start flaunting his wings as a producer. He then began serving up various Spielberg-styled films but directed by other directors – including the likes of Tobe Hooper’s Poltergeist (1982), Joe Dante’s Gremlins (1984), Barry Levinson’s Young Sherlock Holmes (1985), Robert Zemeckis’s Back to the Future (1985) and Frank Marshall’s Arachnophobia (1990), among others. Batteries Not Included was made under Matthew Robbins, a director who, along with his writing partner Hal Barwood, has conducted some interesting and worthwhile work within the genre – the superb Mediaeval fantasy Dragonslayer (1981) and the intelligent zombie film Warning Sign (1985) – although has failed to ever make a big name for himself or enjoy major success. Barwood and Robbins began writing scripts including Spielberg’s second film The Sugarland Express (1974) and MacArthur (1977) and also directed the likes of Corvette Summer (1978) and The Legend of Billie Jean (1980). These days Robbins solo wrote the script for the Guillermo Del Toro films Mimic (1997), Don’t Be Afraid of the Dark (2011) and Crimson Peak (2015), while Hal Barwood now writes and directs Lucasfilm computer games. Batteries Not Included was originally intended as an episode of Steven Spielberg’s fantasy anthology tv series Amazing Stories (1985-7) but Spielberg considered the idea such a good one that he had it developed to feature-length. The screen story comes from Spielberg’s Amazing Stories script editor Mick Garris, who would later become one of the worst directors to ever grace the genre with Stephen King adaptations such as Sleepwalkers (1992), The Stand (1994) and Riding the Bullet (2004). There is an amazing number of later-to-be-famous names on the script. The script came from writing team of Brent Maddock and S.S. Wilson who had written the previous year’s cute robot hit Short Circuit (1986) and would go onto write Tremors (1990) and a number of other genre films. Also on script was animator Brad Bird who had made the cultish Family Dog episode for the first season of Amazing Stories and would go onto direct the excellent The Iron Giant (1999) and the Pixar films The Incredibles (2004) and Ratatouille (2007), before breaking into live-action with Mission: Impossible – Ghost Protocol (2011) and Tomorrowland (2015). 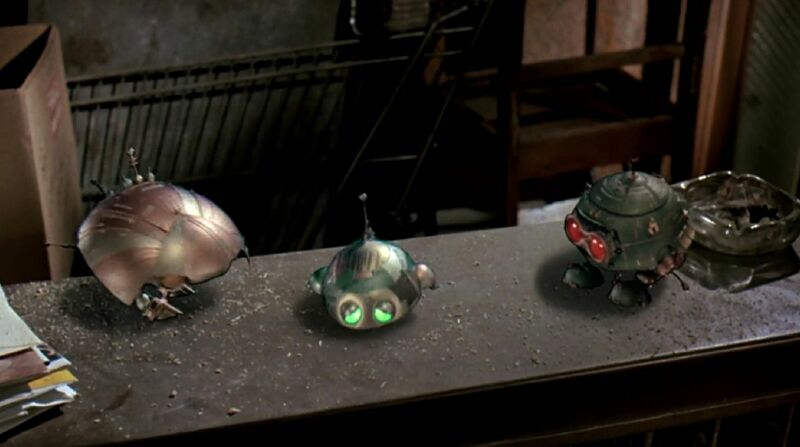 However, by the time Batteries Not Included was made, the Spielbergian formula had become so predictable that one can virtually anticipate this film’s every move – the villain’s redemption at the end; in the dead cert guarantee that when the house is demolished the saucers are going to return by the end and rebuild it. 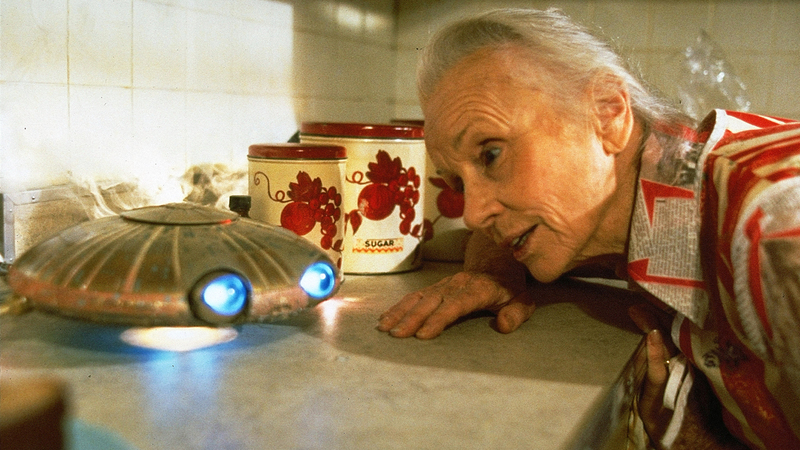 The surprise is that, despite the cliches, Batteries Not Included remains a film of many charms. Not the least of which are the adorable dinky-size flying saucers that sprout everything from miniature buzzsaws to laser cigarette lighters and helicopter vanes, duel with paintbrushes, work as short order cooks, even scuttle about inside startled diners’ hamburger buns. The one other great thing about the film is the pairing of real-life husband-and-wife team Hume Cronyn and Jessica Tandy as the seniors. Jessica Tandy especially, gives a performance of full-blown eccentricity that holds much appeal. Matthew Robbins occasionally miscues many of the dramatic scenes and the film spends too much time with its villain and weak supporting characters. However, it rises above itself consistently enough whenever the saucers are around to hold endearing charms. The one final thing that cannot go unmentioned is James Horner’s fine score – there is an absolutely delightful moment where he choreographs a waltz to the saucers’ entrance into and dance through the apartment.